Cor this one is good. Arthur’s expression absolutely makes it. I ran across your site on Facebook when it was posted as a link for the Rachel Maddow Show. I loved your site so much that I had to post it on my profile on FB and had to send it to various friends. Keep on posting these types of pics. Arthur will love ’em when he grows up!!! Love these ! 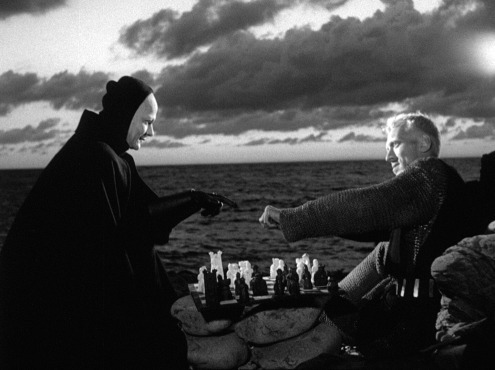 Seventh Seal is my favorite so far. Keep them coming. Clever Arthur and mum! Proving to be a big hit with my kiwi mates. Soooo cute. I think this is my favourite so far. Brilliant. My favourite movie. The picture is so funny. Very good. Black and white, just like Bergman did it. You are a genius, and Arthur is inscrutable. This one is my absolute favorite! Max von Sydow should see this. Thought about doing any scenes from Risky Business, Dirty Dancing or Rocky? 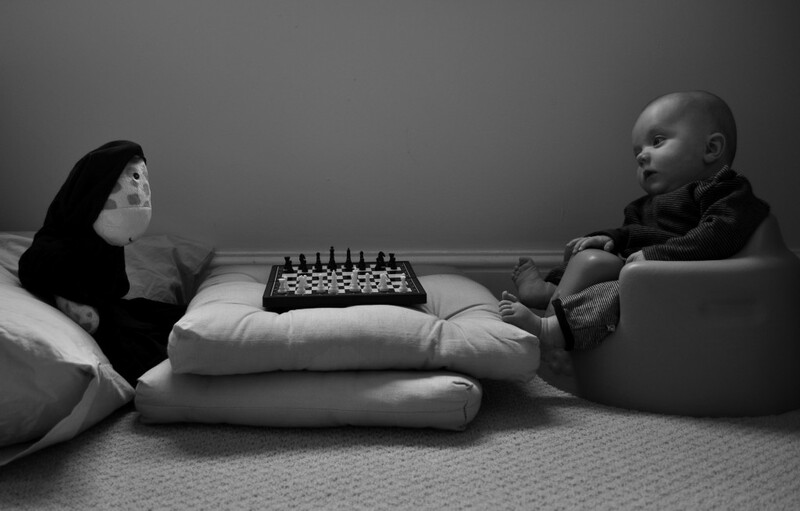 lol, the chess board isn’t facing them…. I refer you to Ingmar Bergman’s original shot. The chess board isn’t facing them either. OK, so, say you’ve come up with this fabulous “My Baby Recreates the Movies” idea. Close Encounters? Hilarious. 12 Angry Men (in B&W, of course) with 11 stuffed animals? Brilliant. Rear Window? Oh yeah. But having your kid (in his bumbo seat no less — nice touch!) play chess with the Giraffe of Death? Pure and utter genius. I stand (well, sit on the couch) in awe. Really don’t see the point in promoting this. Barely any enjoyment out of it and it appears you’re screening most comments as well. Sad of the morning show to interview someone over something so pointless. This one is deferentially my favorite! Arthur’s expression is priceless! You have brought kids natural curiosity and honest responses to another level by featuring these pictures with this blog! And that is not pointless:) Arthur rocks!! Sorry I meant definitively…..not deferentially automatic spelling mistake!